Designed to fit the 21.5-inch aluminum iMac with a 16:9 aspect ratio, the Zorro Macsk is a frame that fits over the front of the iMac to add touchscreen functionality. Apparently, there’s at least one person who wants a touchscreen iMac. But Apple’s new iMacs do not have touchscreens, and there are no signs that touchscreens are in the iMac’s immediate future. To get that touchscreen iMac, you have to take matters onto your on hands and use LumiaView’s Zorro Macsk. 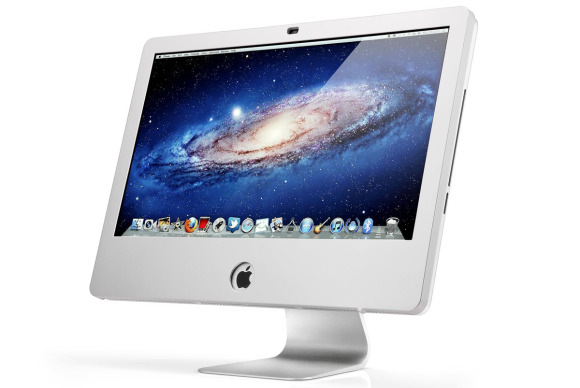 Designed to fit the 21.5-inch aluminum iMac with a 16:9 aspect ratio, the Zorro Macsk is a frame that fits over the front of the iMac to add touchscreen functionality. Instead of using a mouse, you can tap the screen to press buttons, drag onscreen items with your finger, and use gestures similar to those used on an iPad. Thanks to the iPad, touchscreen interfaces are widely accepted, but right now, the experience doesn’t quite translate to a desktop computer. You can’t just slap a touchscreen on a Mac and expect the same usability as an iPad. While there are issues with the Zorro Macsk, the main issue is that OS X was made for mouse and keyboard input, not touch. I tested a silver Zorro Macsk. 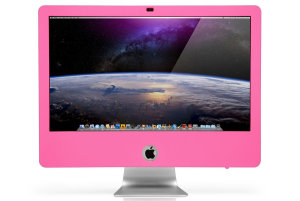 LuminaView also offers black, white, green, blue, pink, and a classic style that matches the black and silver motif of the iMac. The outer shell of the silver Zorro Macsk looks like it is made of coated plastic. Zorro Macsk on a 2011 21.5-inch iMac. The Zorro Macsk requires very little effort to set up. The most difficult part involves applying the included plastic protective film on top of the iMac screen. The screen must be cleaned first, and then the film is placed on the screen. Even after wiping the screen down for a good 15 minutes, I found it very difficult to keep dust and debris away while laying the film on the screen. I often had to lift the film off the screen to get rid of a speck of dust. Then there are the air bubbles, which I was able to clear by using the edge of a credit card to smooth the bubble out. I made sure I cleared all the air bubbles on the active part of the screen, thinking that maybe an air bubble could cause operating problems. It took about 30 minutes to clean the screen, apply the film, and clear air bubbles. You can use the Zorro Macsk without the film, but the film provides a smoother surface to drag your fingers across. If you slide your finger across your iMac’s screen, you’ll actually feel a good amount of resistance that makes you try harder to perform a swipe. The Zorro Macsk on a 2012 21.5-inch iMac. Fortunately, the next few installation steps barely take a minute. The Zorro Macsk uses the magnets in the pre-2012 iMacs to keep itself in place, so all you have to do is angle it on to the iMac’s front from the top, and then close the bottom, where the magnets will catch on to the iMac. Plug the Zorro Macsk’s cable into a USB port, and you’re ready to roll. No software drivers are necessary. The Zorro Macsk’s webcam hole doesn’t line up properly with the 2012 iMac’s FaceTime HD camera. It’s fine with older iMacs. The Zorro Macsk did fit on a new 2012 21.5-inch iMac, the one with the new thin design, but the device was created for the older iMac, not the new one. The Zorro Macsk covers the thin edge of the iMac, so you lose that visual aesthetic. The main problem is the lack of magnets in the 2012 iMac—they aren’t there to hold the Zorro Macsk in place. It rests on the iMac and feels secure, so long as the iMac is facing at a slightly upward angle. But if you tilt the iMac forward, the Zorro Macsk lifts off the face of the computer. You could use double-sided tape on the back of the Zorro Macsk so it adheres to the iMac securely. The other problem is that Apple slightly shifted the FaceTime HD camera on the new iMac, so the camera isn’t centered on the Zorro Macsk’s hole. The Zorro Macsk gets in the way of the camera. The Zorro Macsk support gestures, some of which are the same as those for iOS or a Magic Trackpad, which helps lessen the learning curve. Tapping an icon once or twice is the same as single or double click. Holding your finger down on an item performs a right click. 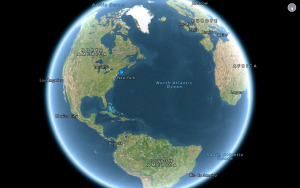 You can finger-pinch zoom, and you can rotate an image by placing two fingers on the screen and then turning clockwise or counter-clockwise. Other finger gestures include two-finger swipes for scrolling vertically or horizontally, three-finger swipes up or down for minimizing or maximizing a window, three-finger swipes left or right to go back or forward pages in Safari, five-finger swipes for switching desktops, opening Mission Control, or opening Exposé. LuminaView also includes two-handed gestures that could be helpful. With both hands on the screen, a swipe down quits the app you are in. Swiping your hands away from each other zooms in on the whole screen, and swiping your hands towards each other zooms out. These gestures worked fine for me, but there was one two-handed gesture I could never perform properly: swiping up to show the desktop. The gestures help with using the Mac more efficiently, but they don’t do much to solve the main problem with using a touchscreen interface on a Mac—OS X wasn’t made with touch targets in mind. Often, on-screen buttons were too small to tap, or it was difficult to select a menu item. For example, the red/yellow/green buttons to close/hide/expand Finder windows were very difficult to tap. Acessing a hidden Dock was nearly impossible, because the edge of the Zorro Macsk around the screen prevents you from dragging the cursor far enough past the edge of the screen to pop-up the Dock. It was also difficult to simply select an application or document in a Finder window in list view. Two-finger swipes to scroll didn’t work for me, because the interface couldn’t discern my swipe from selecting an item. That meant I had to use the scroll bar with my finger, which was also difficult because the scroll bar is so thin. Changing to icon view helped when it came to selecting items. Where the Zorro Macsk really comes in handy are with iOS games that have been brought to the Mac. These games are designed with the iOS touch interface in mind and they work on the Mac, but they work better with touch than with point-and-click. You can play Angry Birds on your Mac the way it’s meant to be played, with your fingers pulling back the slingshot to launch birds. The difference is more dramatic in a fast-paced game and you’re frantically tapping on the screen, games like Jelly Defense or Plants Verses Zombies—it’s so much more efficient to finger tap than to drag a cursor and point-and-click. The Zorro Macsk is available in colors such as pink. During the course of this review, LuminaView released a firmware update to resolve several issues. Unfortunately, the firmware software updater was available only as an .exe file, and required Windows to work. A LuminaView represenative said that a Mac-compatible firmware updater is in the works and will be released “soon.” Granted, LuminaView will probably apply the update at the factory, so chances are that if you buy a new Zorro Macsk, it’ll have the latest firmware. But what about future firmware updates, or what if you already bought a Zorro Macsk? If you don’t have Windows installed on your iMac, you need to find a Windows PC, attached the Zorro Macsk using USB, and then run the updater. It’s confounding that a device that’s for the iMac—and really, can be used only by the iMac—requires Windows in order to receive updates. If you have the right applications, the Zorro Macsk can be a productive input device. But in general, OS X isn’t really ready for full-time touch UI, and that limits the Zorro Macsk. You can still use a mouse/trackpad and keyboard with the Zorro Macsk, so it can be a handy secondary input device. Updated 12/27/12 with information about a Mac-compatible firmware updater.